The Dutch court determined that the valid scope of Apple's asserted design-related right was narrow, which means it was not infringed upon by Samsung, according to Florian Mueller of FOSS Patents. The court said it took into account prior art in order to narrow the scope of Apple's patented design right. The prior art considered in the case was six different designs, including the HP Compaq TC 1000 and a Knight-Ridder tablet concept first detailed in 1994. "The two companies need the courts in various jurisdictions to clarify where Apple's exclusive scope of protection ends and Samsung's freedom to compete begins," Mueller explained. "There's no mathematical formula based on which they could simply agree that Samsung's products are allowed to have a degree of similarity up to (for example) 70%. Instead, they need guidance from judges." 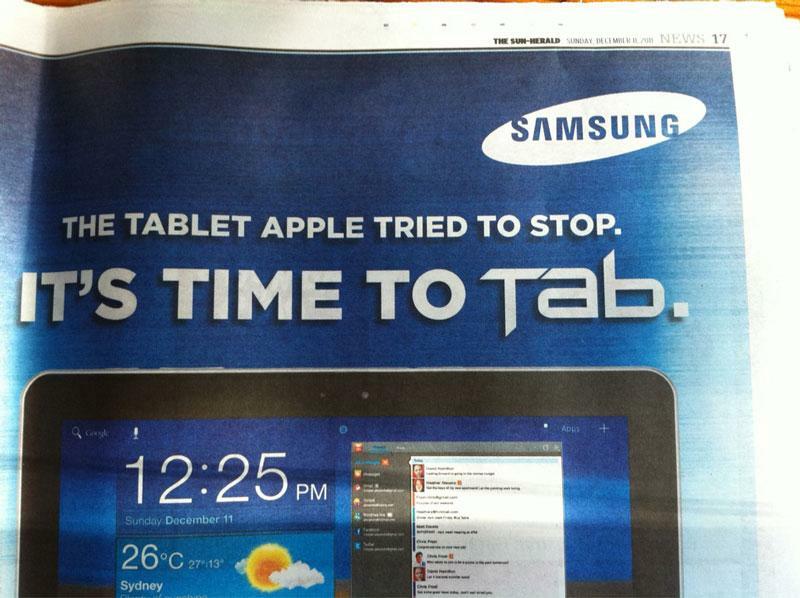 The latest ruling is yet another setback for Apple in its attempts to bar sales of the Galaxy Tab family of products. Apple found some initial success and even prompted Samsung to redesign its tablet and create the Galaxy Tab 10.1N to avoid infringement, but many earlier injunctions that had temporarily barred the sales of Galaxy Tab products have since been overturned, allowing Samsung to release its products. The Dutch court's ruling comes a week before the Dusseldorf Higher Regional Court in Germany is set to hear an appeal related to a preliminary injunction granted to Apple. In addition, Germany's Dusseldorf Regional Court is scheduled to decide in early February whether the Galaxy Tab 10.1N infringes on Apple's design patents. Last week, a German court tossed a lawsuit in which Samsung accused Apple of violated a patent related to 3G/UMTS wireless communications. And earlier in the week, Apple filed a new lawsuit in Germany accusing Samsung's Galaxy S II and nine other smartphones, along with five tablet models, of patent infringement. The ongoing legal battle between Samsung and Apple got underway last April, when Apple filed the first lawsuit, accusing Samsung of copying the look and feel of the iPhone and iPad. Both companies are now engaged in a worldwide legal battle that has sparked lawsuits in 10 countries across four continents.